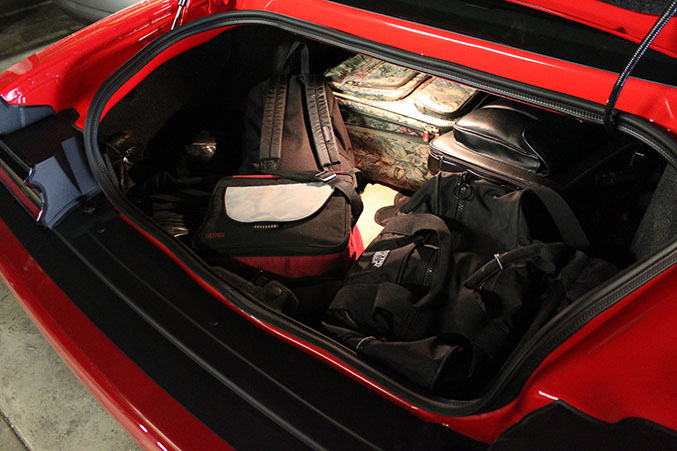 To that end, when presented with the opportunity to use a cabin near Big Bear Lake, California for the weekend, we loaded up the Challenger with every piece of gear we could conceivably need over the course of three days, along with three adults and one bulldog, and headed for the hills. Big Bear isn’t exactly an epic journey from Los Angeles – just a couple of hours out of town and into the San Bernardino mountains – but it’s enough distance to see how the car really behaves on long drives, especially when loaded to the gills with gear and passengers. Using it outside of its primary purpose – destroying tires – things one might’ve overlooked previously start to make their presence better known, like the six speed transmission’s skip shift feature. 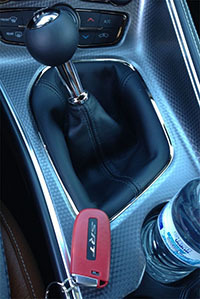 Under certain circumstances the gearbox will lock out second gear during an upshift from first, forcing a 1 to 4 shift. Those who might not be familiar with this feature could misinterpret it as a problem, but it’s actually designed into the transmission in the interest of fuel economy. Skip shift is no means exclusive to Mopars – the function can be found on numerous models that use Tremec six speed transmissions, including Corvettes, Camaros, Mustangs, etc. But on a 707 horsepower car it does feel a bit out of place, and when crawling along in LA freeway traffic it can be a bit of an annoyance to suddenly find yourself in an argument with the shifter. Thankfully the feature only engages under rare, low-load circumstances, so avoiding it is typically just a matter of just winding out first gear a little more to prevent triggering it. That said, ordering an aftermarket eliminator module would be one of the first things we would do if we owned the car. On the way to the lake any fears that the Hellcat might’ve lost its grand touring capabilities were quickly dispelled. The interior is still as cavernous as ever, and the back seat, which is typically included as a formality in pony/muscle cars rather than a place for real people to sit, is actually quite ample. With the Challenger’s full size sedan-like dimensions it meant that everyone aboard could situate themselves without compromise. Along with well bolstered, Alcantara-clad front buckets that are both heated and ventilated, dual zone climate control and a 900 watt, 18 speaker stereo, the Hellcat certainly isn’t a bad place to spend an extended amount of time. 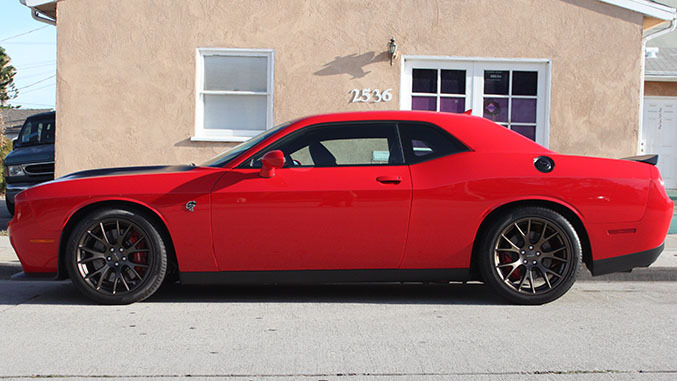 In terms of ride quality, it’s worth noting that while the SRT Hellcat model of the Challenger and Charger shares its three-way adjustable dampers with the standard SRT 392, it gets stiffer springs and bigger sway bars that’re unique to the top-spec model. On the track it means the Hellcat feels noticeably more buttoned down than the SRT 392, but on the road it comes with a bit of compromise in terms of ride quality. The adjustable shocks go a long way here though – leaving them in Street mode, the most compliant setting, did not illicit any complaints about a jostling ride from our passengers. Once we were off the freeways and into the twistier sections of the smoothly-paved mountain roads leading to Big Bear, ratcheting up the suspension stiffness into Sport mode curtailed roll and dive further without much loss of comfort. 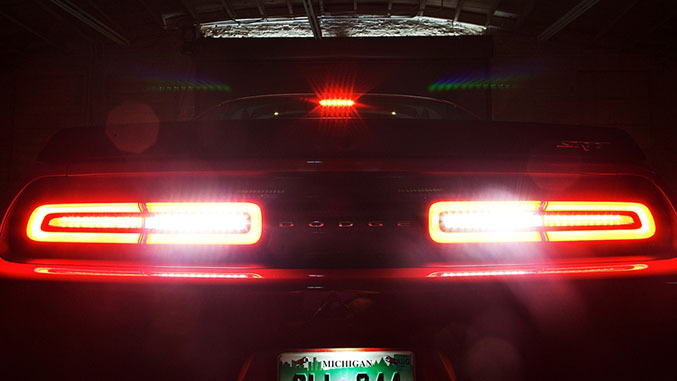 We’ve noted this on other drives of the 2015 Dodge Challenger and Charger SRT models, but it bears repeating – we’d really love to see a physical button or toggle switch for driving modes if for no other reason than to make quick changes to the suspension settings. 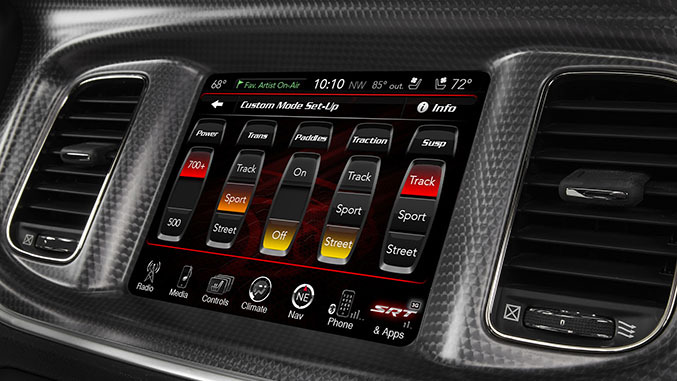 As it works now, adjusting the damper stiffness requires pressing the SRT button on the center console, selecting the Custom tab on the touchscreen, then selecting the Custom set-up menu, then choosing the suspension mode from that menu. Here you’re given the option to choose between 500 or 700+ horsepower engine output, Street, Sport and Track traction and stability control modes, along with the same three settings for suspension stiffness. On 8-speed automatic equipped cars you can also adjust transmission behavior and toggle the shift paddles on or off from this menu, as seen below. We’ve found ourselves leaving the infotainment system on this screen the majority of the time, largely because getting back to this menu requires the same sequence of button and touchscreen presses every time you want to revisit it. The drawback to that habit is that you’re only given limited information about other functions while in this driving mode menu, like which audio track is playing and the current climate control settings. It’s unlikely this system will change significantly within the current iteration of these cars, but one can dream. Despite the car’s performance focus, the Hellcat's long wheelbase and adaptive dampers still yield a coupe that’s at home on long drives. It may capable of blasting down the quarter mile in under 11 seconds, but the Dodge still seems happiest when on Vanishing Point duty. What’s next for our long term tester? We’ll be heading out to a road course while the weather is dry and the air is hot to see how the supercharged Hemi fares under conditions that are more or less the opposite of what we encountered on our last trek to the track with a Challenger Hellcat, and we’re looking forward to take a deep dive into the various functions available from the extensive SRT Performance Pages functionality that’s built into the Uconnect system. After that? Well, you’ll just have to wait and see.